GDX Trucking is a truckload carrier offering a wide range of trucking services. 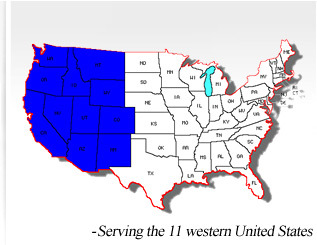 Serving the 11 western United States, GDX Trucking specializes in efficient freight movement and can easily meet your standard or custom requirements. With locations in San Diego, Phoenix and Portland, OR., we are well positioned to fulfill you truckload needs. Of course, there’s more to picking the right trucking company than just on-time freight delivery. At GDX Trucking, our service merely begins with on-time freight delivery. As our client, you can look forward to personalized customer service, quick response times to your custom requirements, and a commitment to superior customer service. Our job is to insure that your freight moves in the most expeditious and cost-effective manner. Whether your company requires total freight management or assistance on a single shipment, our professional staff stands ready to assist your every need. Copyright 2008. All rights reserved by GDX Trucking.